That shirt is so cute! I love the sleeves and it looks great on you!! I love the look. It looks so cute for spring. I LOVE this top and think it looks so cool with the jacket! super cute love! love the sleeves with the jacket. and i have the t5 which is like the same thing. we should share tips ha. aka play around with our cameras together. So obsessed with that top- I think I love just about everything by Free People! Also, these pictures look awesome, I would have never noticed the coloring was off! Omg this top is seriously so major and looks amazing on you! Obsessed with that top. I honestly don’t see anything wrong with your photos - the “blue tint” kind of acts as a filter that goes with your blog color theme if you ask me! Okay -- this might be one of my favorite outfits you've shared! You look fabulous, I love those sleeves and hat! I love this top! And the whole look! So adorable. I have that camera, ask away. Love this look, classic and chic. Your top is so pretty, love the sleeves! I am obsessed with the bell sleeve detail on this top!! It is so cute!! The top looks so comfortable and love how the sleeves peek through the jacket. All perfectly paired with those booties! Those sleeves are EVERYTHING and love how they peek out of your jacket! Could you be anymore Gorgeous!?? Seriously, it's so unfair! Ha just kidding, ok only I little...it's hard being an ugly ducking (me). This is SUCH a cute outfit! So you, I love it! Obsessed with this whole look! I don't even notice the coloring of the pictures because the whole outfit is beyond! I have the same camera and the same exact issue. It makes me CRAZY! This outfit is awesome! 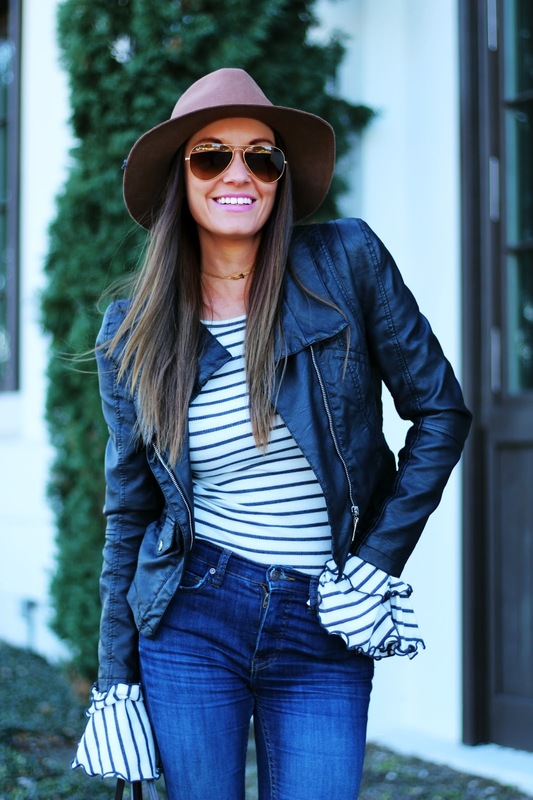 I love how you styled the sleeves under the jacket - such a fun idea!